The 2013 / 2014 Subaru Legacy sedan and Outback crossover are the only vehicles to receive highest possible score in the new IIHS Front Crash Prevention (FCP) test program. One of the key contributing factors of Subaru’s success in the U.S. is the safety of all of its automobiles. And the brand just keeps getting better at it. Subaru has announced very successful crash test results from the IIHS that shows just how safe their vehicles really are. The new 2014 Subaru Legacy sedan and 2014 Outback crossover both received the highest possible score of six points in a new IIHS Front Crash Prevention (FCP) test program. The two Subaru models are only two of seven vehicles tested by IIHS out of 74 cars tested, to receive the highest possible rating of “Superior.” This shouldn’t come as a surprise, because Subaru has been building safe cars for decades. In fact, the Japanese automaker has been testing their cars since the 1960’s before safety testing methods had yet to be established. And Subaru sets safety targets for all of their vehicles before they ever reach the production stage. The safety targets are set first, and then the design team uses computers to conduct impact simulations. Those results are then incorporated into the new design. Real-world impact simulations are then conducted in Subaru’s own test facility. This procedure takes place in all of their vehicles and were conducted on the new 2014 Legacy sedan and Outback crossover at the test facility in Japan. The new crash study conducted by IIHS also found that forward collision warning and automatic braking systems, such as Subaru’s newly developed EyeSight system, are helping drivers avoid frontal crashes. The 2013/2014 Legacy and Outback were the only vehicles that received the highest possible score of six points. Subaru is growing quickly in the U.S. and it’s partly because of these safety factors in all their vehicles. Consumers are doing their research and they’re finding these results and it helps determine what car they will buy. 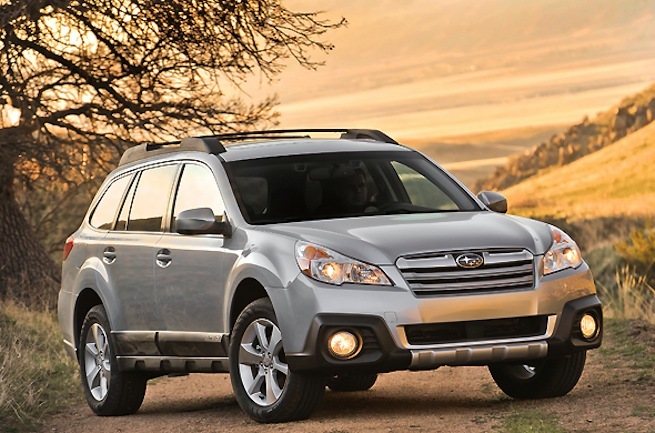 Every one of Subaru’s models are listed as IIHS Top Safety Picks and now the 2014 Subaru Legacy and 2014 Outback models tested to 2013 TSP+ and FCP status, is further proof that the brand delivers and has the safest vehicles for American buyers.